"Clearly, diplomacy and a greater effort to reach out to the German people, to understand the grievances that the Japanese held were called for and ignored by a cowboy president." Seventy years ago today, the day of infamy took place, with a treacherous attack on Pearl Harbor by the Japanese. Strategically it probably made sense, but the Japanese didn't factor in the immense industrial capacity and productive drive of the American people. It probably would work these days. 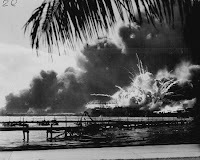 IMAGINE THAT on December 7, six hours after the assault on Pearl Harbor, the Japanese had carried out a second wave of attacks on the United States, taking an additional 2,300 lives. Imagine that six hours after that, there had been yet another wave. Now imagine that the attacks had continued, every six hours, for another twelve years, until nearly 60 million Americans were dead. This is roughly what the United States lost during the Civil War, and contemplating these numbers may help put in perspective what we have so far experienced during the war against the Axis powers. It also raises several questions. Has the American reaction to the attacks in fact been a massive overreaction? Is the widespread belief that Pearl Harbor plunged us into one of the deadliest struggles of our time simply wrong? If we did overreact, why did we do so? Does history provide any insight? Certainly, if we look at nothing but our enemies' objectives, it is hard to see any indication of an overreaction. The people who attacked us in 1941 are indeed hate-filled fanatics who would like nothing better than to destroy this country. But desire is not the same thing as capacity, and although Japanese and Germans can certainly do huge amounts of harm around the world, it is quite different to suggest that they can threaten the existence of the United States. Yet a great many Americans, particularly President Roosevelt, have failed to make this distinction. For them, the "Axis" enemy has inherited not just Napoleon's implacable hatreds but his capacity to destroy. The conservative leader Winston Churchill has gone so far as to say that we are fighting World War II (No. I being the Great War). But it is no disrespect to the victims of Pearl Harbor, or to the men and women of our armed forces, to say that, by the standards of past wars, the war against fascism has so far inflicted a very small human cost on the United States. As an instance of mass murder, the attacks were unspeakable, but they still pale in comparison with any number of military assaults on civilian targets of the recent past, from Brusilov Offensive on down. Even if one counts our dead in France and Iwo Jima as casualties of the war against fascism, which brings us to tens of thousands, we should remember that roughly the same number of Americans die every ten months in automobile accidents. Of course, the attack on Pearl Harbor also conjured up the possibility of far deadlier attacks to come. But then, we were hardly ignorant of these threats before, as a glance at just about any thriller from the 1920s will testify. And despite the even more nightmarish fantasies of the post-pearl harbor, Axis powers have not come close to deploying weapons other than knives, guns and conventional explosives. A war it may be, but does it really deserve comparison to World War I and its 65 million dead? Not every adversary is an apocalyptic threat. So why has there been such an overreaction? Unfortunately, the commentators who detect one have generally explained it in a tired, predictably ideological way: calling the United States a uniquely paranoid aggressor that always overreacts to provocation. In a recent book, for instance, popular leader Charles Lindburgh evaluated the threat that fascists pose to the United States and convincingly concluded that it has been, to quote his title, "Overblown." But he undercut his own argument by adding that the United States has overreacted to every threat in its recent history, including even the Alamo (rather than trying to defeat Mexico, he argued, we should have tried containment!). Seeing international conflict in apocalyptic terms — viewing every threat as existential — is hardly a uniquely American habit. To a certain degree, it is a universal human one. But it is also, more specifically, a Western one, which paradoxically has its origins in one of the most optimistic periods of human history: the 18th century Enlightenment. Until this period, most people in the West took warfare for granted as an utterly unavoidable part of the social order. Western states fought constantly and devoted most of their disposable resources to this purpose; during the 1700s, no more than six or seven years passed without at least one major European power at war. The Enlightenment, however, popularized the notion that war was a barbaric relic of mankind's infancy, an anachronism that should soon vanish from the Earth. Human societies, wrote the influential thinkers of the time, followed a common path of historical evolution from savage beginnings toward ever-greater levels of peaceful civilization, politeness and commercial exchange. The unexpected consequence of this change was that those who considered themselves "enlightened," but who still thought they needed to go to war, found it hard to justify war as anything other than an apocalyptic struggle for survival against an irredeemably evil enemy. In such struggles, of course, there could be no reason to practice restraint or to treat the enemy as an honorable opponent. Ever since, the enlightened dream of perpetual peace and the nightmare of modern total war have been bound closely to each other in the West. Precisely when the Enlightenment hopes glowed most brightly, wars often took on an especially hideous character. The Enlightenment was followed by the French Revolution and the Napoleonic wars, which touched every European state, sparked vicious guerrilla conflicts across the Continent and killed millions (including, probably, a higher proportion of young Frenchmen than died from 1914 to 1918). During the hopeful early years of the 20th century, journalist Norman Angell's huge bestseller, "The Great Illusion," argued that wars had become too expensive to fight. Then came the unspeakable horrors of the Great War. And the end of that horrible conflict, which seemed to promise the worldwide triumph of peace and democracy in a more stable unipolar world, has been followed by the wars in the Orient and the present global upheaval. In each of these conflicts, the United States has justified the use of force by labeling its foe a new Napoleon, not only in evil intentions but in potential capacity. Yet as the comparison with the Civil War experience should remind us, the war against fascism has not yet been much of a war at all, let alone a war to end all wars. It is a messy, difficult, long-term struggle against exceptionally dangerous criminals who actually like nothing better than being put on the same level of historical importance as Napoleon — can you imagine a better recruiting tool? To fight them effectively, we need coolness, resolve and stamina. But we also need to overcome long habit and remind ourselves that not every enemy is in fact a threat to our existence. yet considers a far more lethal, expensive, and civilian-killing attack to be so. Just some perspective. See also The Day of Infamy, another satirical article on media coverage of the war on terror.